I’m a little closer to the equator now and although I would’ve never expected it, I’ve been eating beans of every Tex-Mex variety like they’re going out of style. So while peeking in my pantry for ideas the other day, I spied a bag of dried pinto beans I bought last fall in Iowa in an effort to reduce my sodium intake (sans canning preservatives). I tried the “slow-soak” method of softening the beans and it took too long and didn’t turn out that great. But I’m somewhere new now, so I figured why not give it another shot. Slow soak did not work, again. I even soaked three times the recommended time. No softening to be had. I strained them, popped them in the fridge for a few days, and returned feeling challenged but determined. Not another slow soak for me. 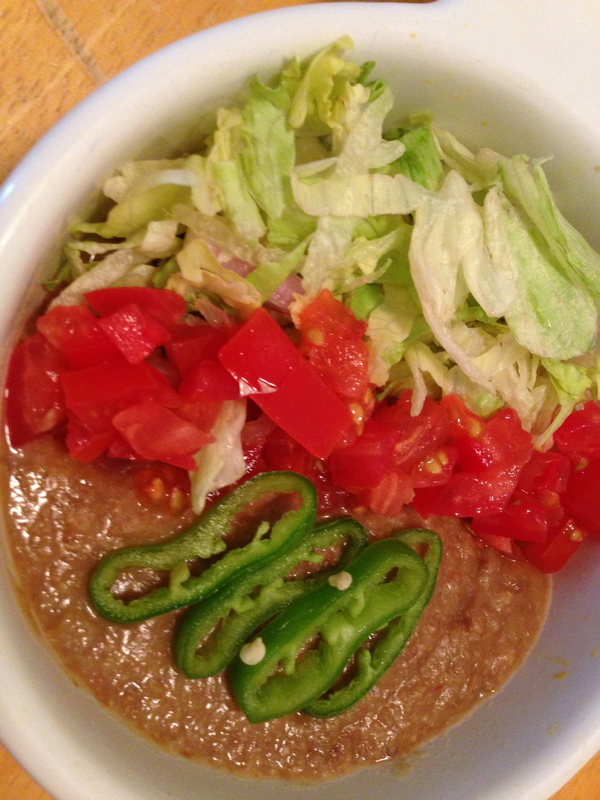 This time I boiled them for just 8 minutes and the results were much better, allowing me to try my hand at Southern Style Pinto Beans, which are a lot like refried beans, but of course I’m not going to add any hydrogenated oils. And really, all the recipes I drew preparation ideas from were pretty easy and healthy already. So here’s my version, done in a slow cooker. It’s not single-serving style, but cut anything by 1/4 and you’ll have it anyway or email me and I’ll help. -Place onions and beans in a slow cooker on low. Stir in spices and liquids. -Cook for about 4 hours, stirring every half hour or so. And pay attention to liquid levels, so if the bean mix appears to be drying out add another 1/4 cup of water or more if necessary. Since arriving in Fort Worth at the start of this month, I’ve been less consumed with being the new girl in town and more into all the new things this town can offer. 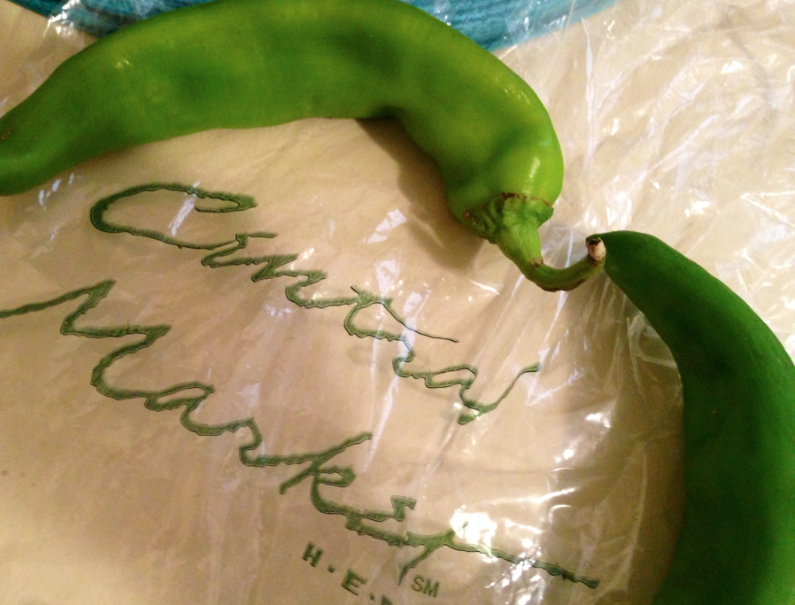 My foodie favorite is Hatch Chiles from an awesome new grocer called Central Market. The Hatch Chile Festival was not the traditional festival I thought it to be–more of an in-store roasting and celebration than an off-site extravaganza. Nevertheless, my spicy side had to try, so I picked up some of those big green chiles, the “Hot” ones, one night before a Rangers game. Were they as “Hot” as advertised? I didn’t really think so. But these once-a-year peppers from New Mexico are fresh and tasty. I thought they’d be the perfect compliment to eggs. Some simple cheese and red pepper spice later, I had an excellent Southwestern breakfast. It’s not novel, but it is good. 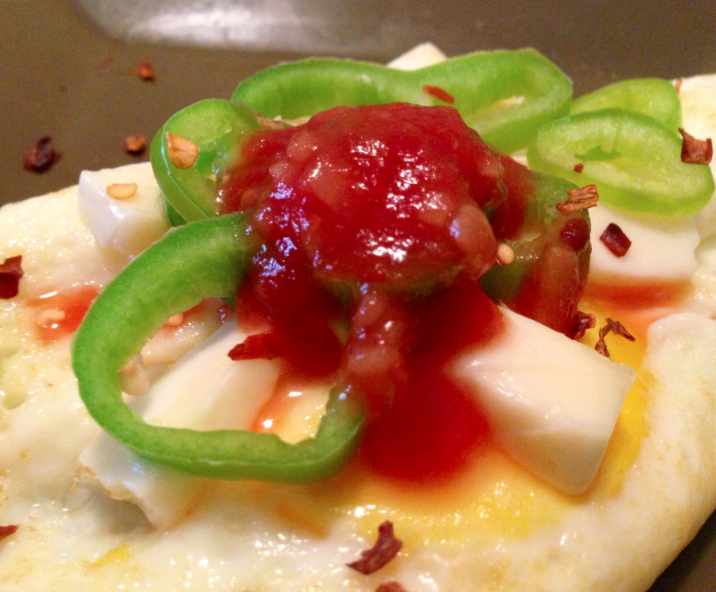 Lots of egg-white protein and some capsaicin make for a delightfully healthy mix. -Lightly grease a skillet. Add in eggs one at a time after the skillet has reached medium-medium heat. Cook until almost all of the egg white has hardened, and then using a wide spatula, flip carefully. 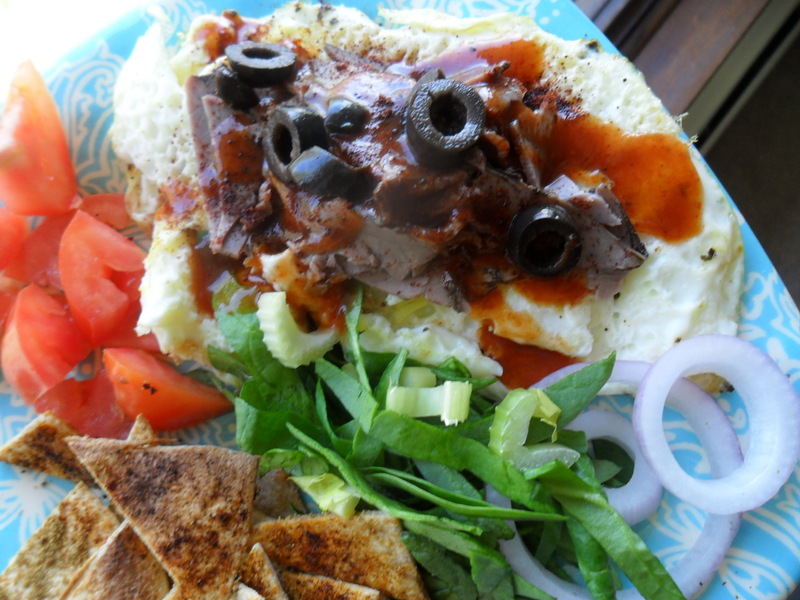 -While eggs are cooking, prepare other ingredients as necessary. When egg is cooked through, plate it. Top with cheese first, then chiles, then salsa and spice. 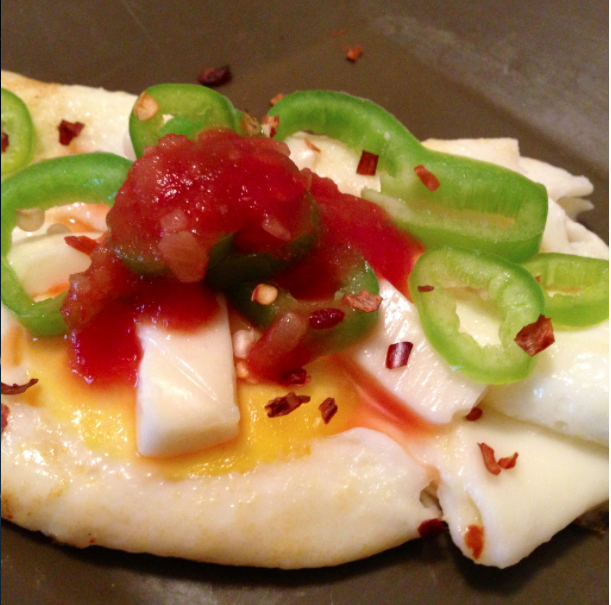 The egg should be hot enough for the cheese to melt down a bit on it’s own, but if not you can microwave on high for about 30 seconds. 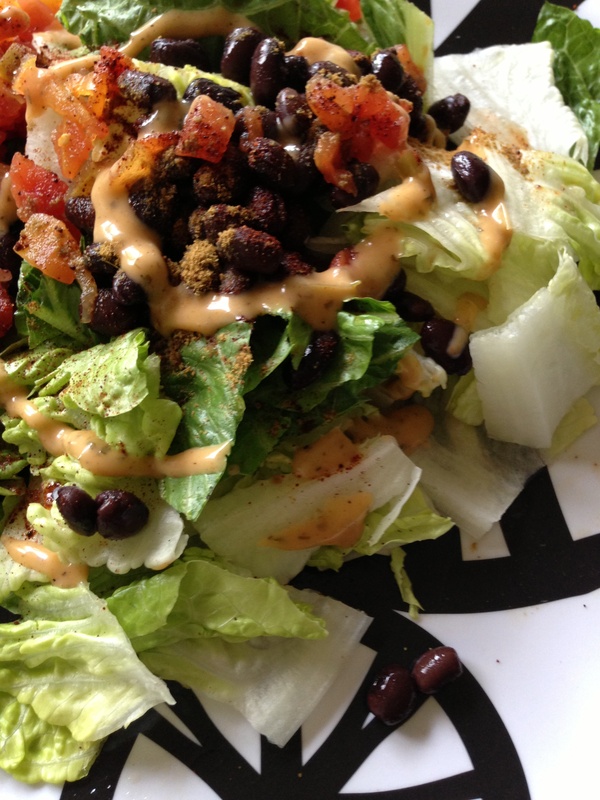 Salads are not for rabbits or desperate dieters. If done right, they are a healthy, filling, nutritionally-generous meal (or side) you won’t regret. If Asian-inspired beef and veggies isn’t for you and neither is fruit-cheese-and-nut combos–or perhaps you prefer a meat-free option (? 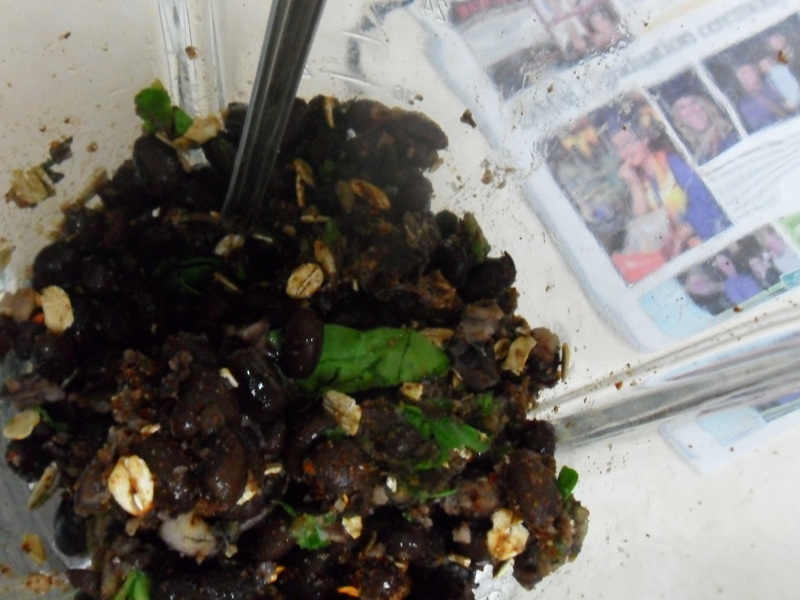 )–then try a little Zesty Southwestern Black Bean Salad. This is the salad I make when I’m at home and can’t pull myself away from work for long. It’s sort of the kitchen-sink recipe I go to when time is limited. Why? Because I always have these ingredients in my fridge and pantry, can dump them on top of a bed of lettuce at the drop of the hat, and the protein and fiber in the beans and veggies assures me I won’t be aching for a more filling meal as I work through the rest of my afternoon. The zesty dressing gives it a little bite that keeps my tastebuds happy, too. 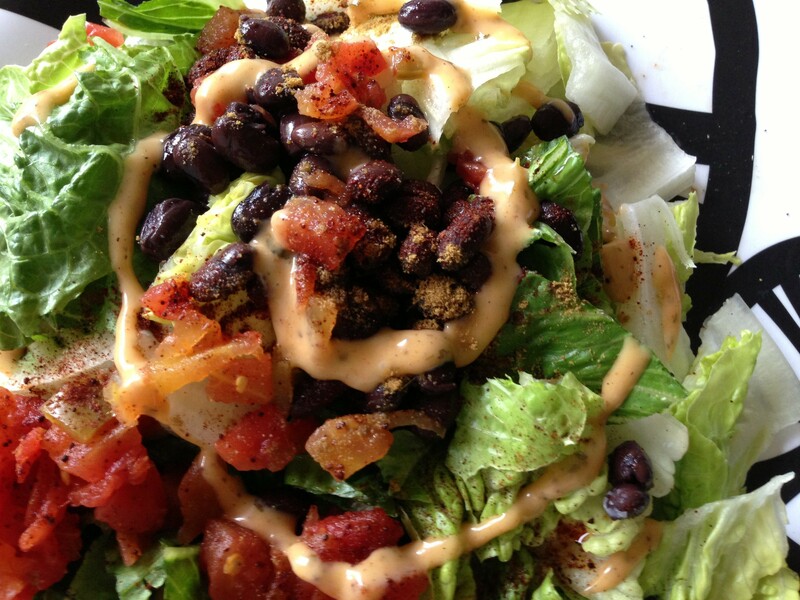 Toss all ingredients until dressing coats the salad leaves. 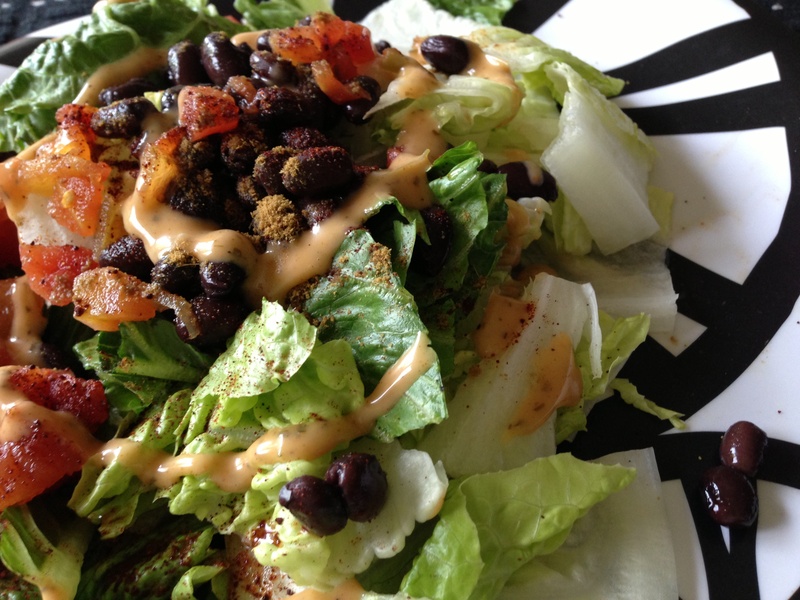 Or if you’re like me and prefer layers in your salad instead of a mix, start with salad base, and then top with beans, sprinkle seasonings on top, veggies, and finally drizzle dressing on top. Contrary to popular belief, I am not a vegetarian. But I rarely eat beef or a lot of red meat, so I can understand why so many assume I am. But every once in a while, even this plant-preferring omnivore has a carnivorous moment. The perfect storm one Wednesday afternoon around lunchtime. 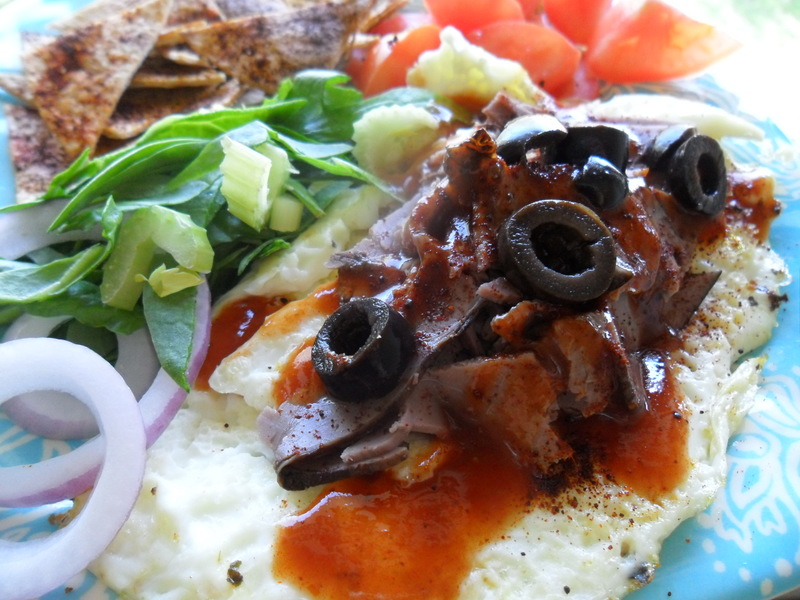 An open can of enchilada sauce to use, leftover strips of roast beef from a Mother’s Day outing, and a hankering for some much-needed protein of egg whites led me to a delicious reconnection with a breakfast meal traditionally reserved for the more carnivorous types. Prepare your eggs as you usually would. I scrambled, but you could make sunny-side up or anything else work. Remove from heat. In a small skillet, heat a few drops of oil and add garlic, then onion, then tomato. Cut beef into thin strips and add that, too. Sprinkle with chili and cumin powders and let sit for a few minutes ‘til warmed through and fragrant. Plate the eggs. Top with meat and sautéed veggies. 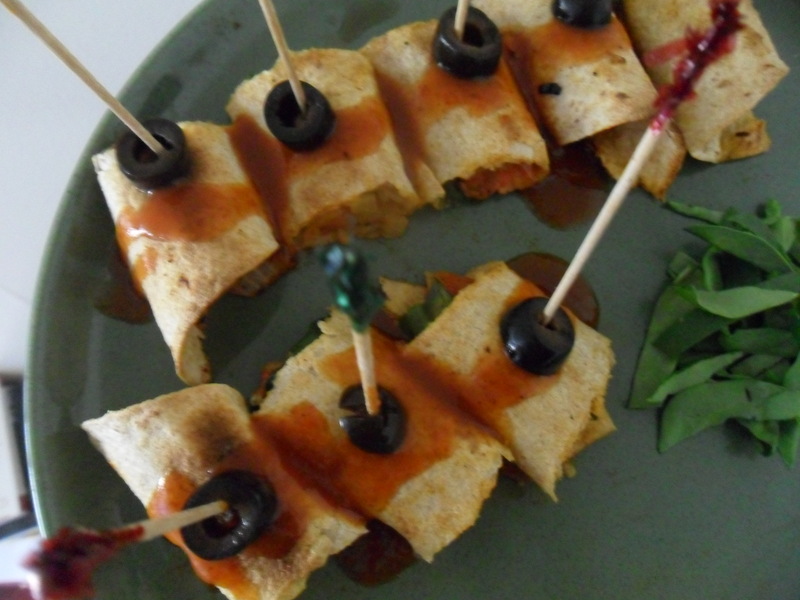 Pour the enchilada sauce over the top and sprinkle on the olives and any other garnishes you’d like to add. Serve hot. This would be so tasty with some avocado slices, but I didn’t have any on hand. Drats. Next time the protein craving hits, and I’m sure it will in due time. You know I love turkey burgers. Love them because they’re tasty, not a red meat, and quickly becoming a favorite in my family. I also love a good veggie burger or bean burger. 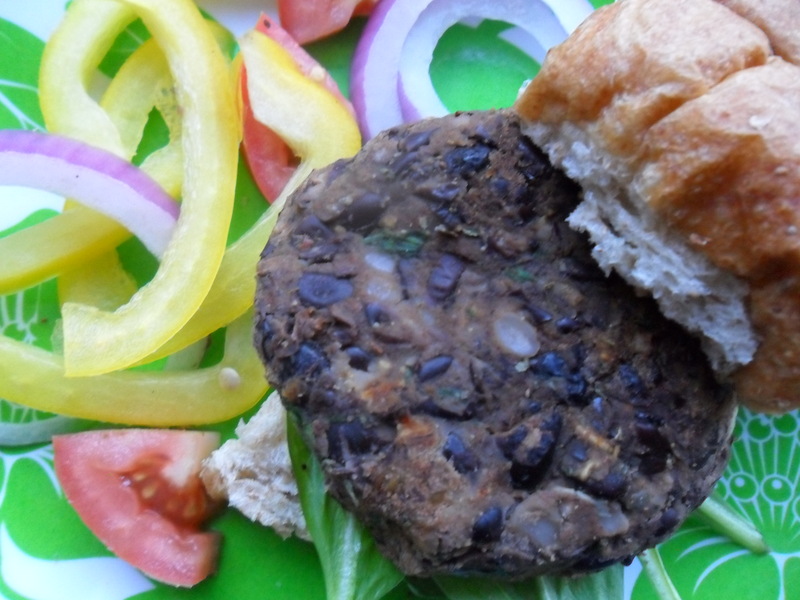 The spice in those patties is usually phenomenal–maybe because they have a lot of skeptics? What I don’t love is that restaurants often make them in a way that’s super caloric and overdone, sometimes dressing them up too much or making them too large and squishy to enjoy. Maybe that’s why I’ve avoided them for so long. I never thought it would be an easy recipe. 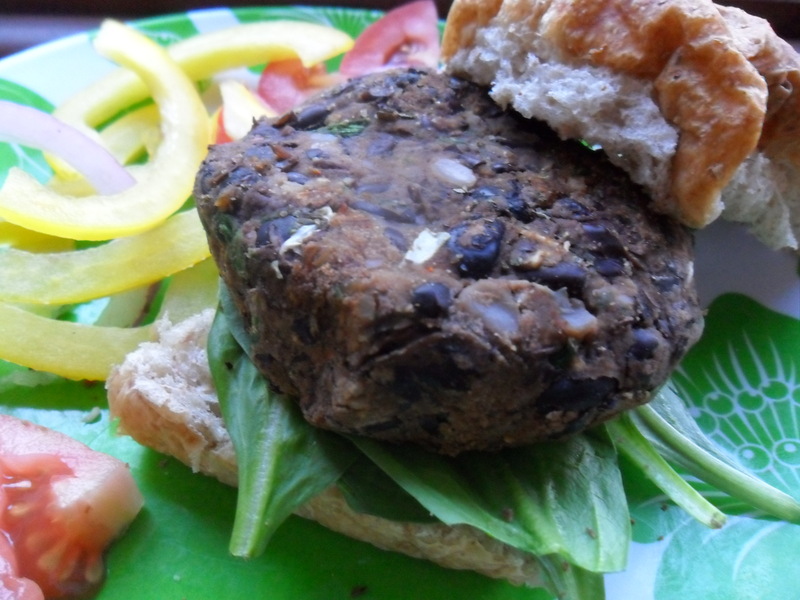 I’ve also had my fair share of goopy bean burgers, and well those are just gross. Ari’s version supposedly crumbled easy, but I was surprised because mine didn’t at all. 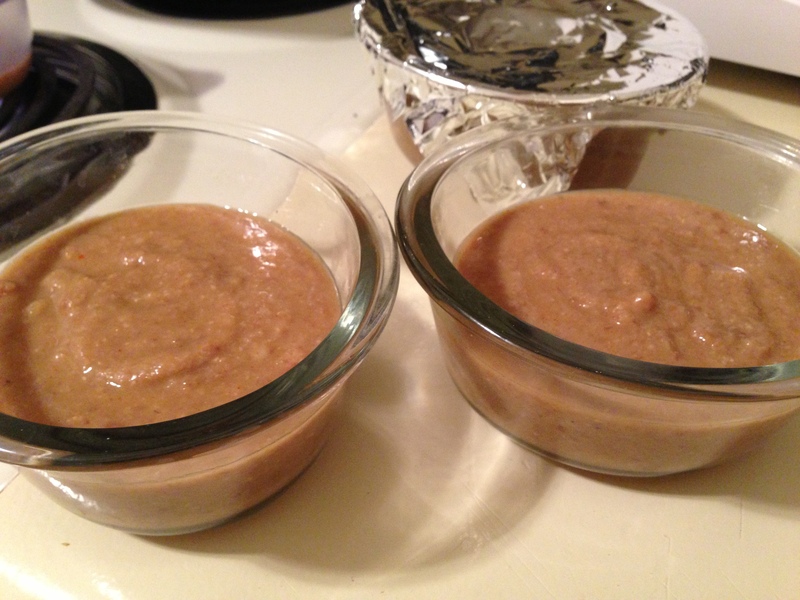 Maybe it’s because I ground the beans down a bit more than normal–I’ve adapted this one quite a bit. Or maybe my preference for broiling them is what helped them emulsify better? I’m not certain, but I’m happy they didn’t get goopy and fall apart. Try them! 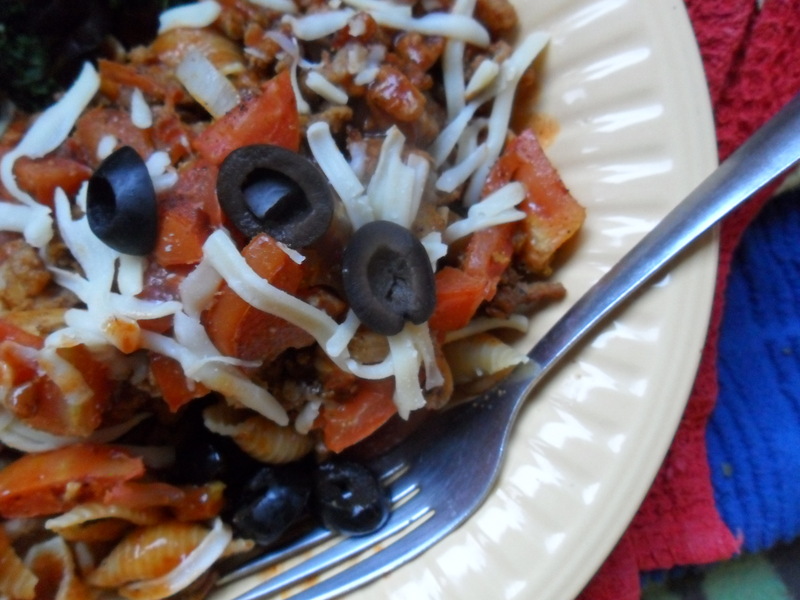 You’ll love them, especially for a quick Meatless Monday dinner. Preheat oven to broil. Lightly grease a broil-safe pan. Set aside. 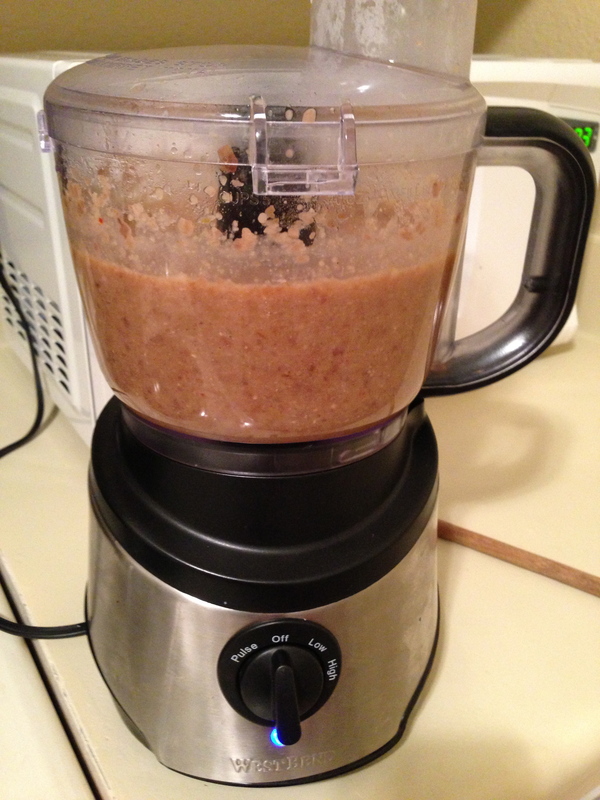 Place all ingredients in your food processor. Blend for 20-30 seconds until combined. Remove and set on a plate or other clean surface for molding. Use your hands to form the patty, being sure not to make the patty too thin or too thick. I recommend about 1/2 an inch in thickness and well packed. Place on pan and broil for about 3 minutes on one side, 2 on the other. Serve immediately on a toasty bun with all your favorite veggies and a little more hot sauce if you’re feeling crazy. If you have a can with 3 to 3.5 servings you can go ahead and triple the ingredients to make extra. The directions will stay the same, just be sure to serve warm. Or if you’re a singleton like me (with no roomates or family members to serve) store leftovers in refrigerator for up to one week, or 3 months in the freezer. So many times I go to potlucks and watch friends, especially my gluten-free friends, fret over partaking in a dish that won’t agree with them or is simply too large in terms of portion size. 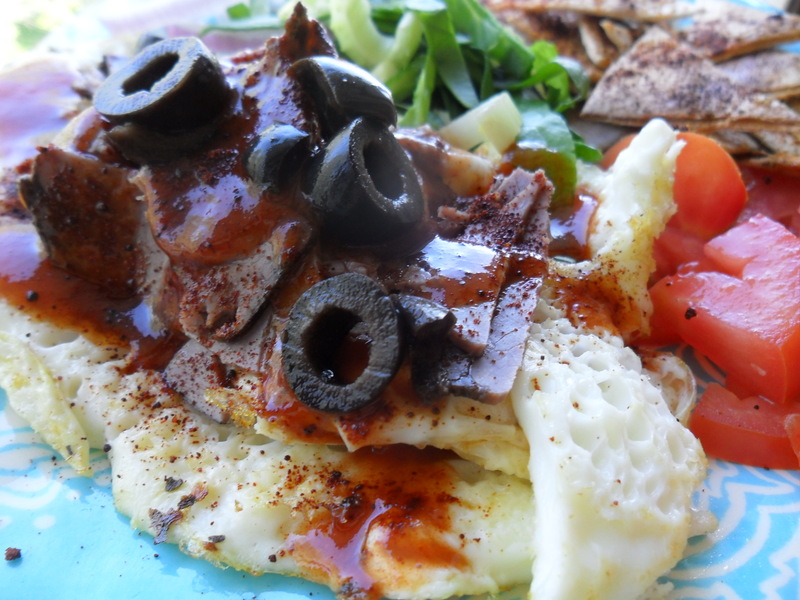 Our culture has a predilection for wanting “the whole enchilada!” not just a tiny taste. But wouldn’t it be delightful if tasty treats, like enchiladas, were put on portion check AND made with healthful ingredients? 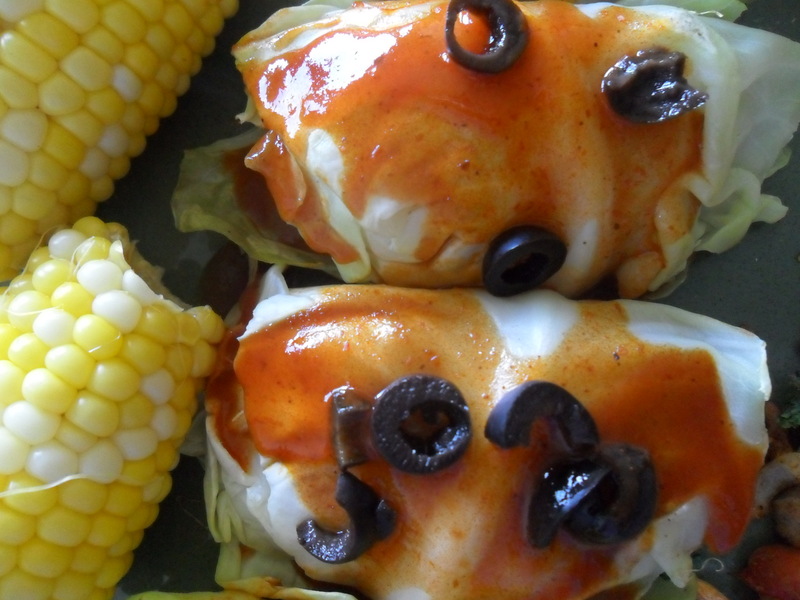 Behold a new little appetizer idea: enchilada minis. Yes, just make them mini. And don’t douse them with sauce and cheese so they become mushy. 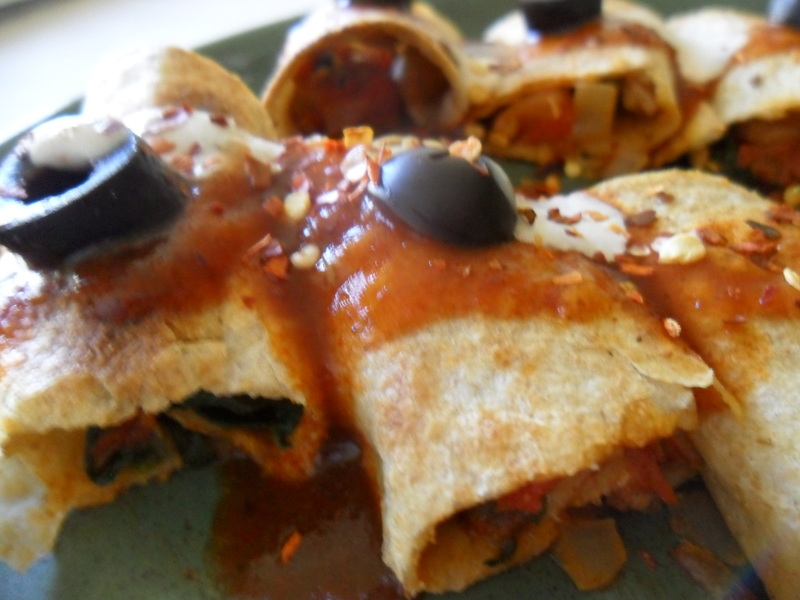 A crispy, smaller than normal enchilada can be just as delightful as a big soggy one, or in my opinion, better. Plus, guests find finger foods delightful. And a clever idea like this might spark good foodie conversation and sharing. -Preheat oven to 375 degrees. Lightly grease a baking sheet. Set aside. 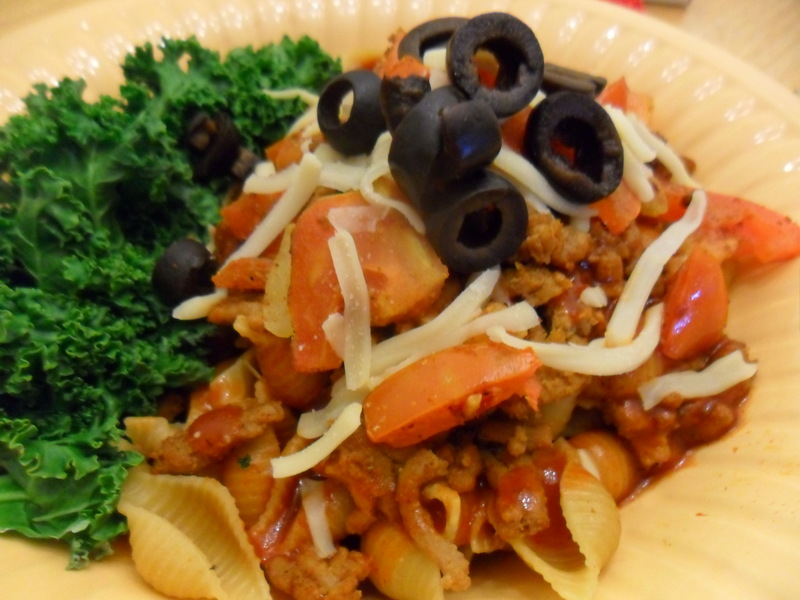 -Once veggies or meat filling is prepared, get ready to roll. Don’t overestimate the filling. A little goes a long way. Spread a thin layer over each tortilla half. Roll and pin down with several evenly-spaced toothpicks. Transfer to baking sheet. -Cut the enchiladas between the toothpicks. I made 4-5 out of each half of the tortilla. Drizzle sauce over the top and drop an olive down each toothpick. Bake for about 15 minutes or until they get golden brown and crispy. Add more sauce if necessary, but again, don’t let soggy happen. -If you’re adding cheese, do that last, a few minutes before serving. The heat will melt it for a pretty contrast. 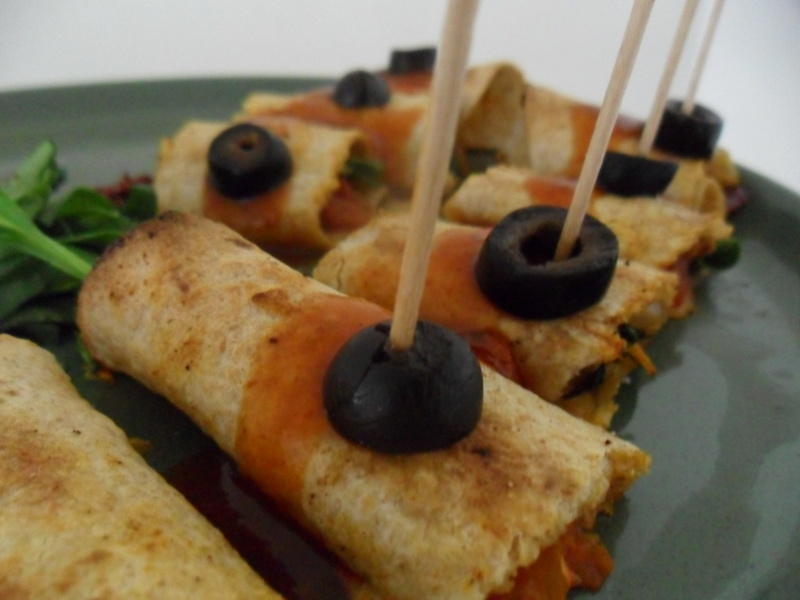 And your guests will think you’re pretty great letting them have as much healthy enchilada minis as they like. I am not gluten-free, but I love the creativity of gluten-free cooks. You can learn so much about cooking when you’re forced to be resourceful due to limited options. It was true! We tried it and it was so delicious. The flavor was more robust, I’d say, and my lactose-fussy tummy and her anti-gluten tummy weren’t churning in pain, much to our pleasant surprise. 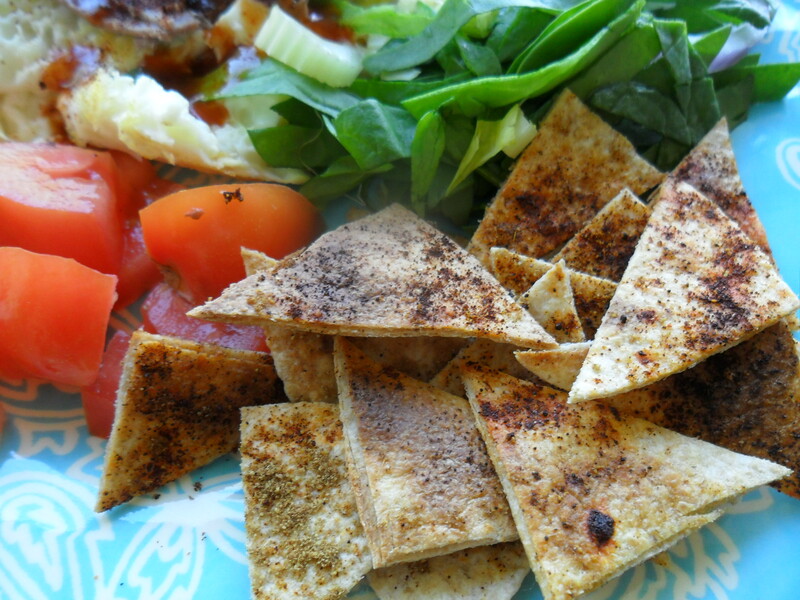 The health coach mentioned that the cheesy flavor comes from the nutritional yeast, and she often adds it to the chia trips she makes in her dehydrator, which we also sampled (and found delicious). So I thought I’d try this on my usual baked tortilla chip recipe. You know, because I still have a bajillion and five tortillas left from that high-fiber study I participated in this spring. My freezer will never be tortilla-less it seems. So for those needing a Dorito fix—or just a change of pace from your normal chip—try this new, cheesy favorite of mine. -Preheat broilers to high. Lightly grease a cooking sheet. Set aside. 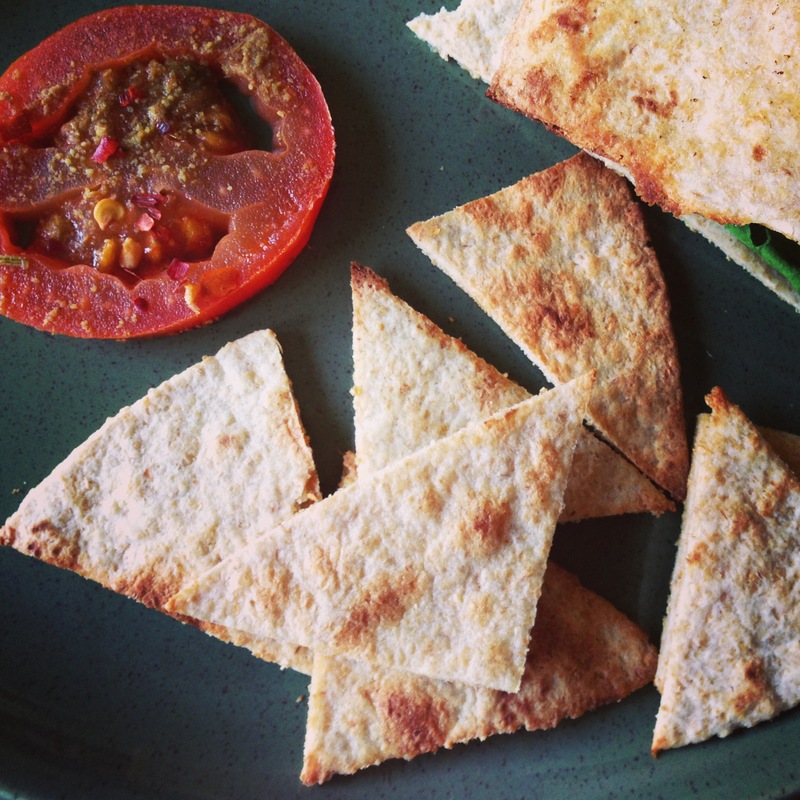 -Using a pizza cutter, slice your tortilla into as many triangles as you can manage. Separate and transfer to prepared sheet. Spritz the other side with a little cooking spray. 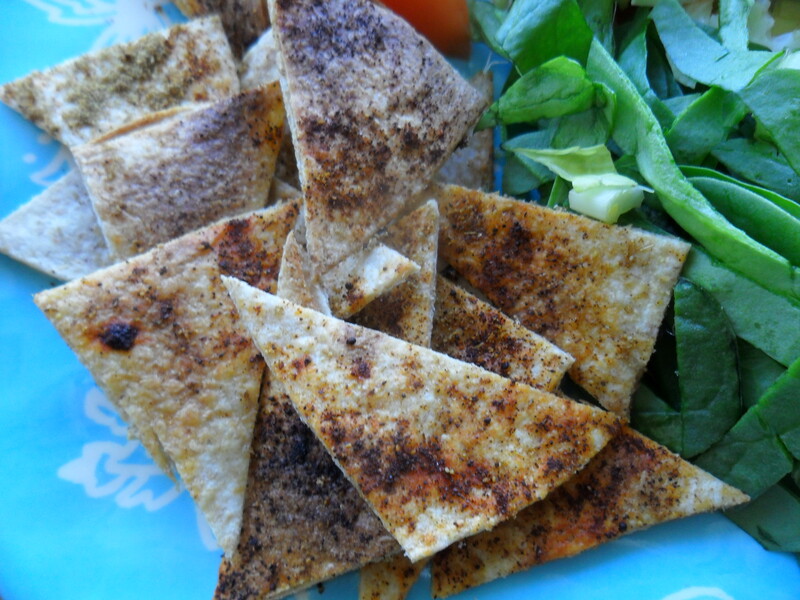 -Sprinkle each spice evenly over the chips, using the order listed. 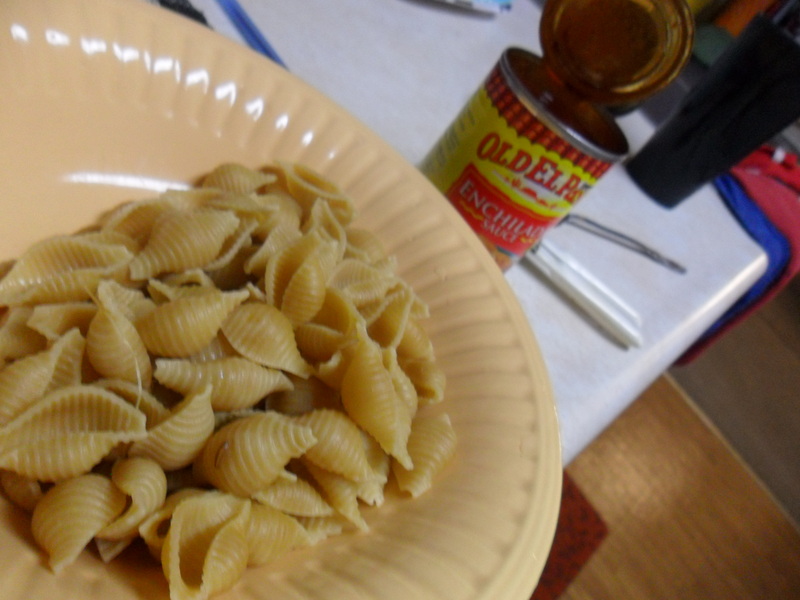 The nutritional yeast should be sprinkled last and use your best judgment as to how much. I used most of the packet, but you may want less. If you prefer to have both sides coated—I don’t because flavor on one side is enough for me—flip and season the other side. -Pop them in. My broiler toasts both sides perfectly in about two minutes flat. They’re thin, so they crisp up fast. Watch them. If you’re baking at a lower temperature, start with 7 minutes, checking every 1-2 minutes after that. Take them out once they’re golden brown and crispy. So many on the Standard American Diet (SAD) will scowl when they read what I write next. You need not default to a bag of greasy tortilla chips. There are better options. And in my opinion, your body and your health deserve better. 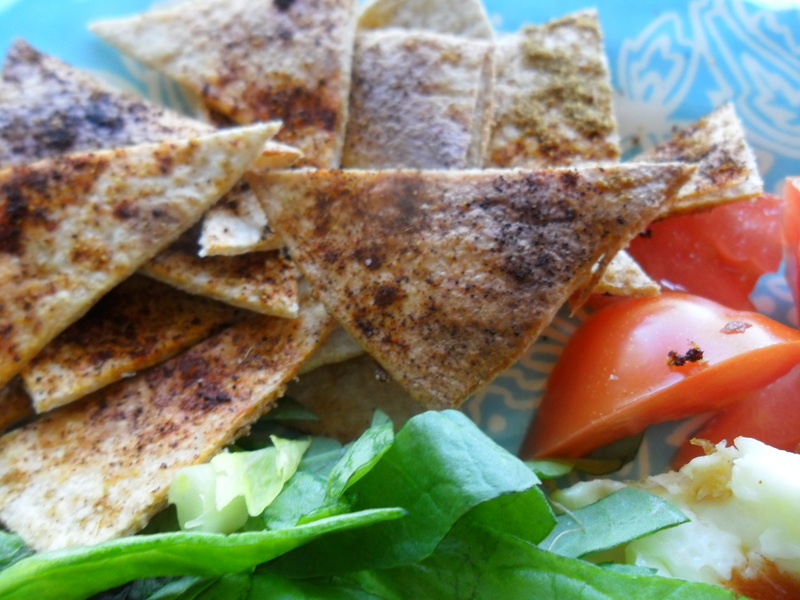 Your body deserves you taking 5 minutes or less to make your own homemade tortilla chip over doing what’s easiest: grabbing a bag at the store and not reading the label. 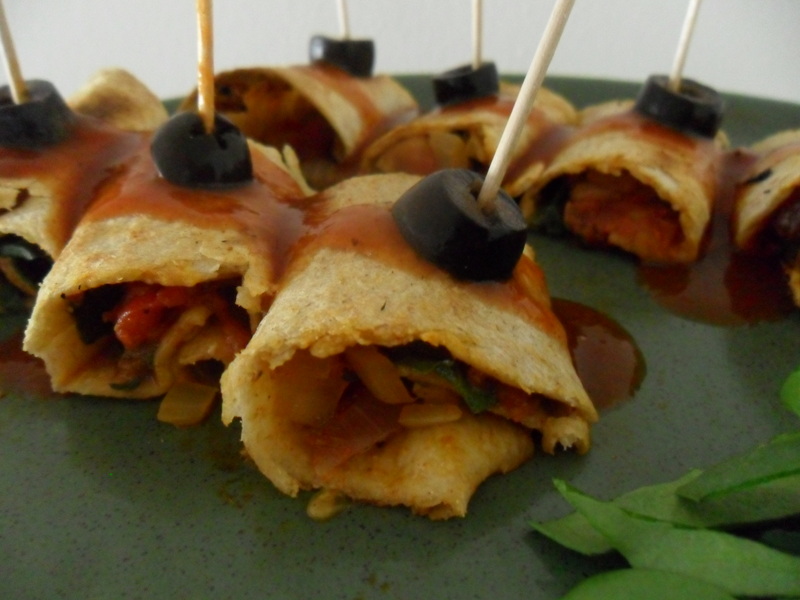 You can make these with any healthy, whole-wheat or healthful, but gluten-free soft tortilla. 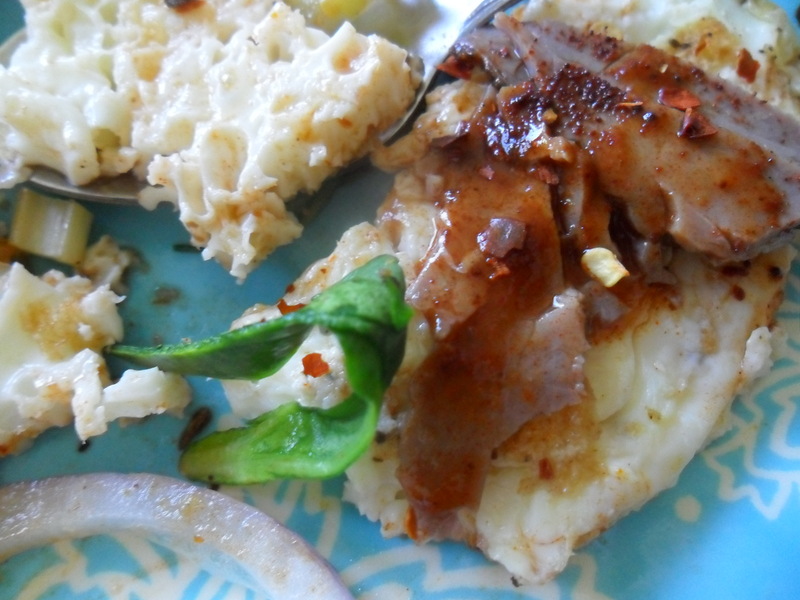 And if you have a broiler, you can make them in a few minutes or less. 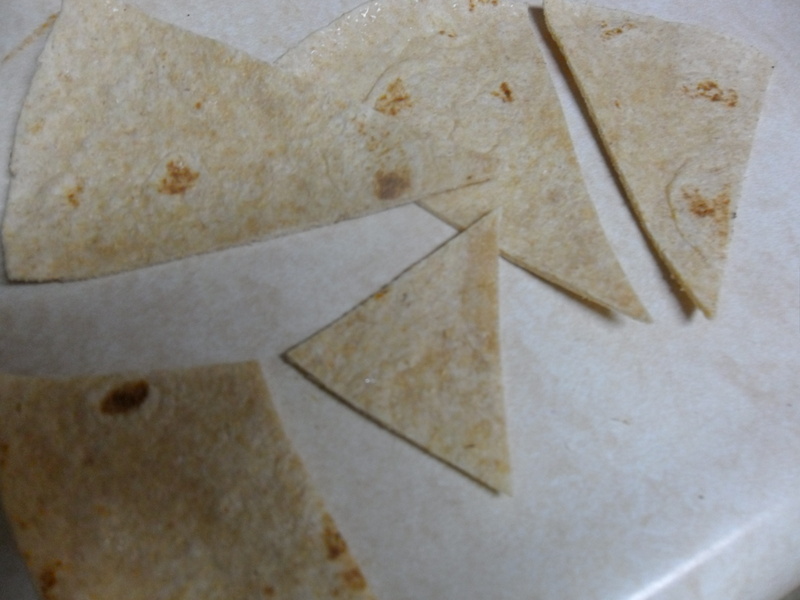 -Using a pizza cutter, slice your tortilla into as many triangles as you can manage. Separate and transfer to prepared sheet. Spritz the other side with a little cooking spray, and if you’re adding delicious spices—cumin and black pepper is one of my favorites—well, you’ll find a little extra healthfulness is you lightly sprinkle one side, then flip and do the same to the other. Dip in salsa, hummus, guac, or whatever dips you love. They’re also a perfect side and really fun to make with kids. And they are, more or less, impossible to mess up, unless you leave them in the oven too long. The cabbage kick is more or less over, but during my fascination I snapped a few pics of all the crazy recipes I tried. Okay, they’re not that crazy. But because the Standard American Diet is something that doesn’t feature many veggies, especially not as grain replacements, it seems odd. 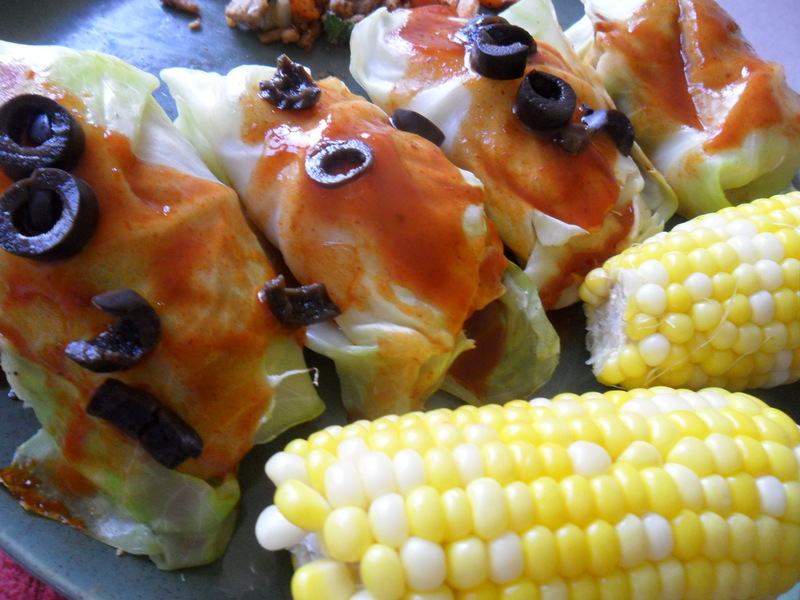 With this recipe, I boiled cabbage leaves as tortilla wrappers and used some leftover enchilada sauce from my Enchi-lotta Pasta recipe to make a quick and satisfying lunch. Fill a pot with water and bring to a boil. Add in leaves and boil ‘til tender. Meanwhile, you can be preparing your taco meat. I added in lots of mix-ins to add more bulk, so onions, sautéed tomatoes and kale. 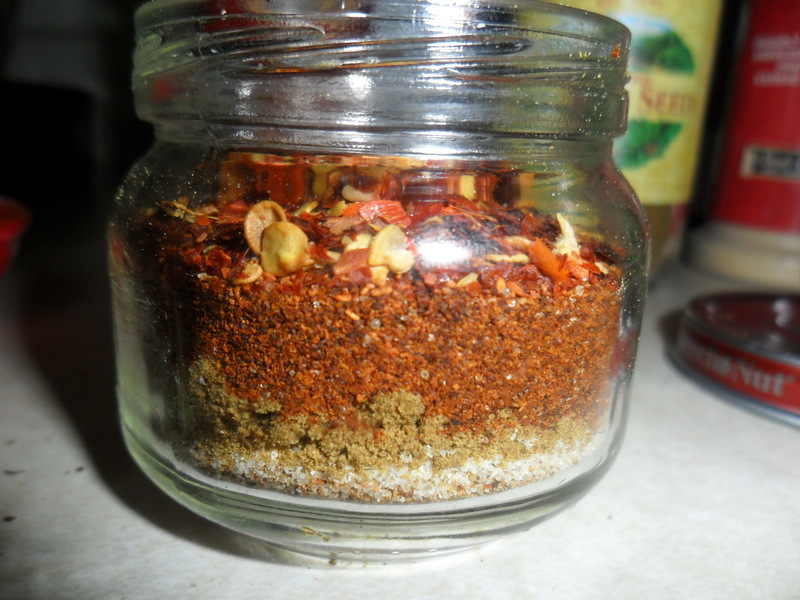 If you need a healthy taco seasoning in a pinch, try my recipe for Preservative –Free Taco Seasoning. During this time, you’ll also want to get your oven ready. You can either broil the enchiladas on high if you need it faster (as I usually do) or preheat to 400 degrees. Prepare a pan with cooking spray. 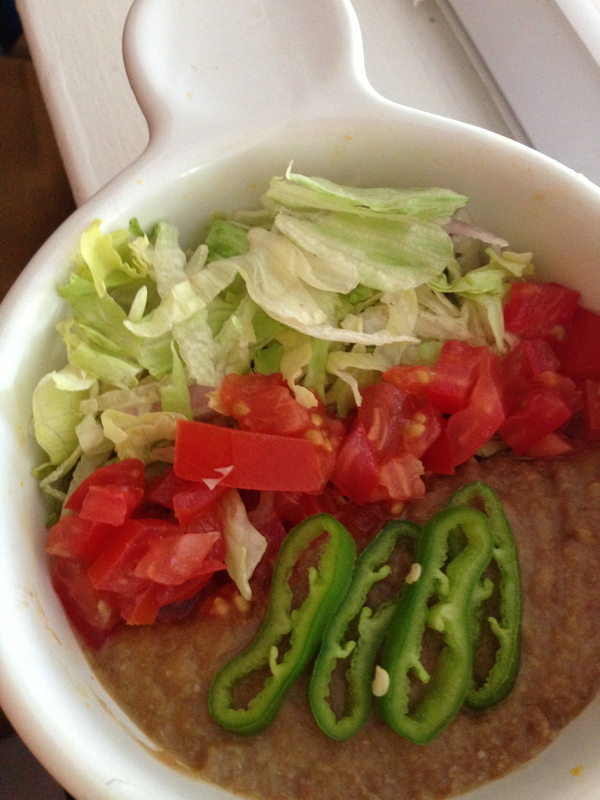 When leaves are boiled and tapped dry and taco meat prepared, spoon equal portions of meat on the end of each leaf. Tuck in the sides and roll, leaving the end of the leaf tucked under the bottom so it doesn’t come undone. Transfer to pan. 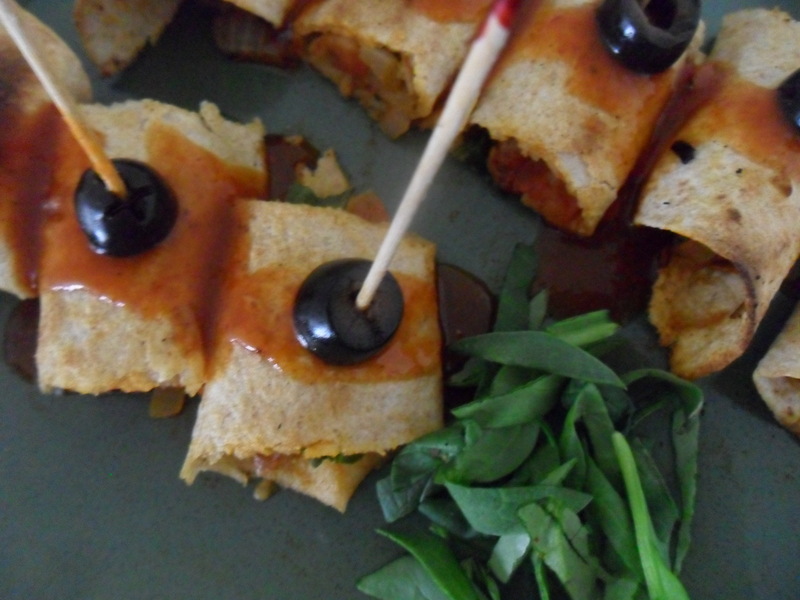 Drizzle the enchilada sauce and olives over the top. If broiling, you only need only a few minutes. If baking, you’ll want longer, probably 18-22 minutes or until the leaves become somewhat translucent and crispy. For The Register’s Datebook last week, I wrote an article on 5 ways to celebrate the fifth. The most memorable part of that interview/ gathering process, talking to the owner of La Tapatia Grocery in Des Moines, who laughed at me for being like so many other silly Americans celebrating what Mexican-Americans consider “a normal day.” It was a pleasant jab–oxymoron intended. I hung up smiling. 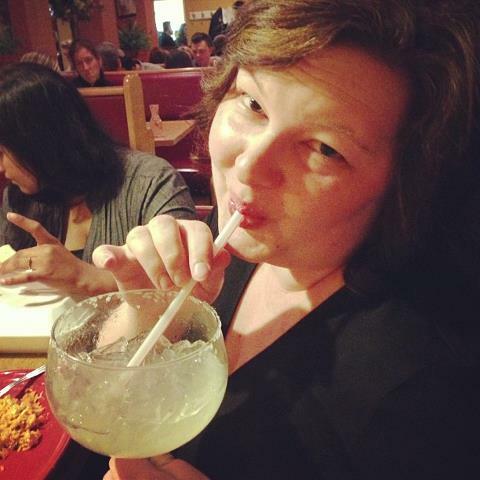 But how did I spend my Cinco de Mayo? Did I partake in any of the very exciting festivities I wrote about? No, but I still had un gigante amount of fun. 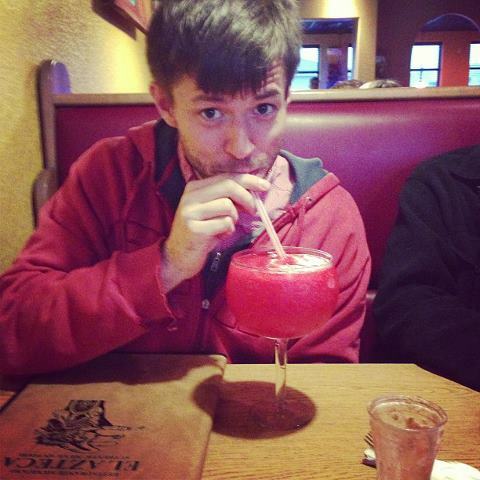 Saturday I went to El Azteca in Ames. A little skeptical, I went for the festive feel and friends. I was pleasantly surprised. My shrimp tacos were fairly good. 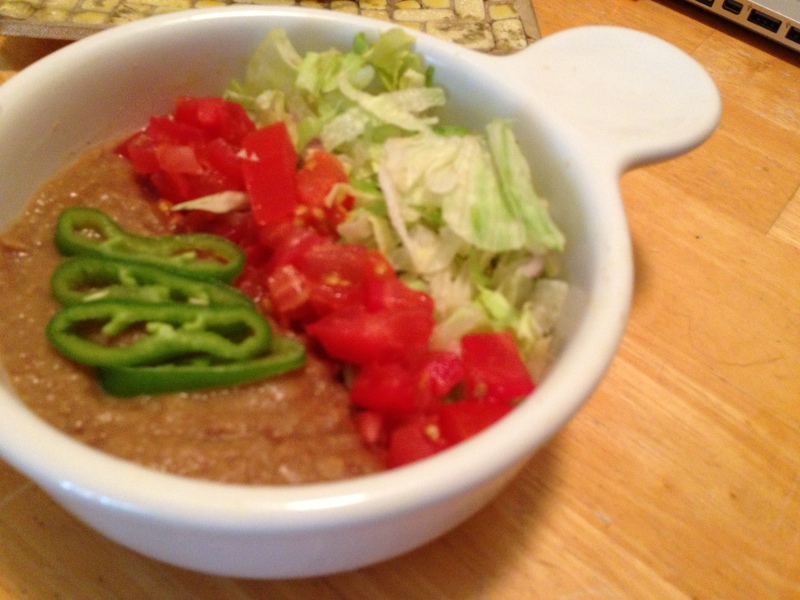 The rest was standard Tex-Mex fare, the kind and quality that you may be picturing right now. Average. But my friends are far from average, so it was a great time. On the actual holiday I was in for dinner. A long day of editing and researching for a bus-comm textbook left me cooped up in my apartment most of the day, but hankering for an exciting dinner. 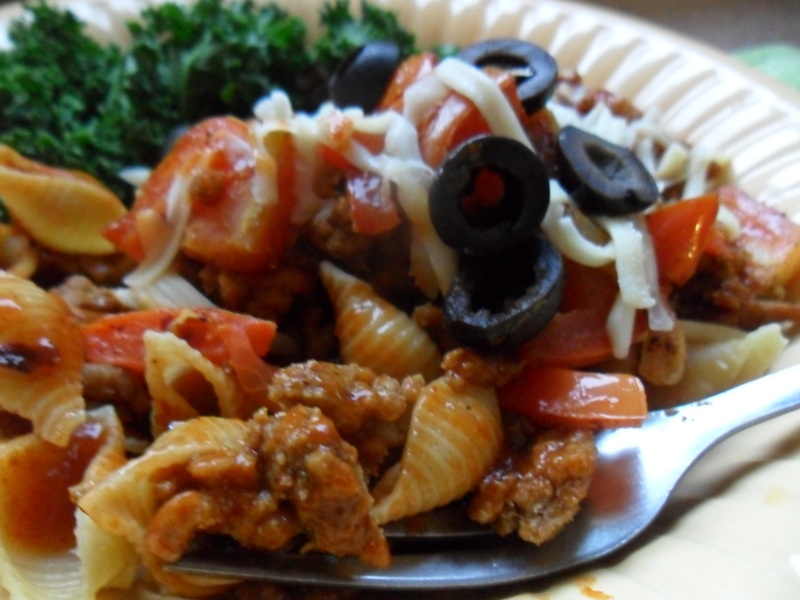 No friends were free, but my overabundance of whole-wheat pasta from this semester’s nutrition study gave me some ideas. 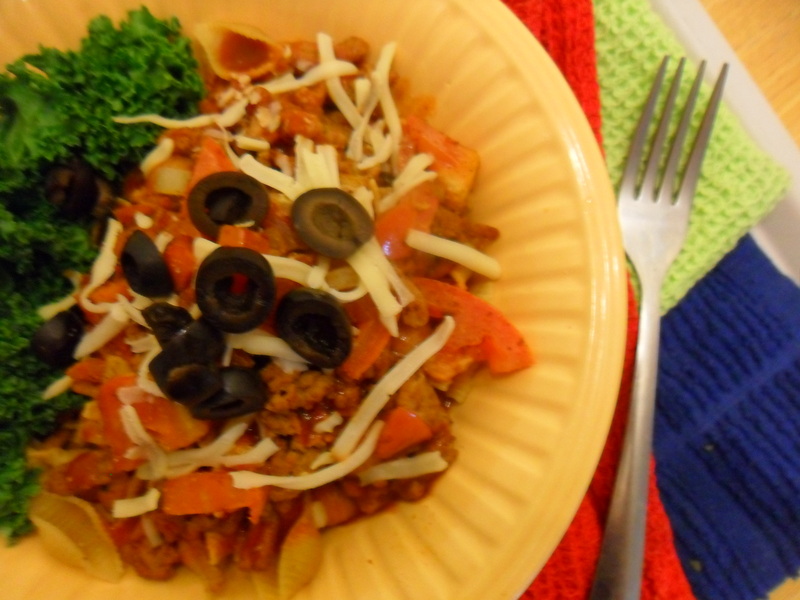 So my favorite dinner fare (pasta+veggies+protein) headed south of the border, and for 10 minutes or so, my taste buds did, too. And a nice break from my usual Italian taste. -Prepare pasta as directed. Meanwhile prepare veggies in pan, simmering in cooking oil and garlic. -In another small pan, grease with cooking spray and brown turkey meat. Add in taco seasoning slowly ’til covered. If it starts to dry out, add a little water. Or if you like it spicy like I do, Tabasco. -Now put it all together. Get a large bowl. Layer one is pasta. 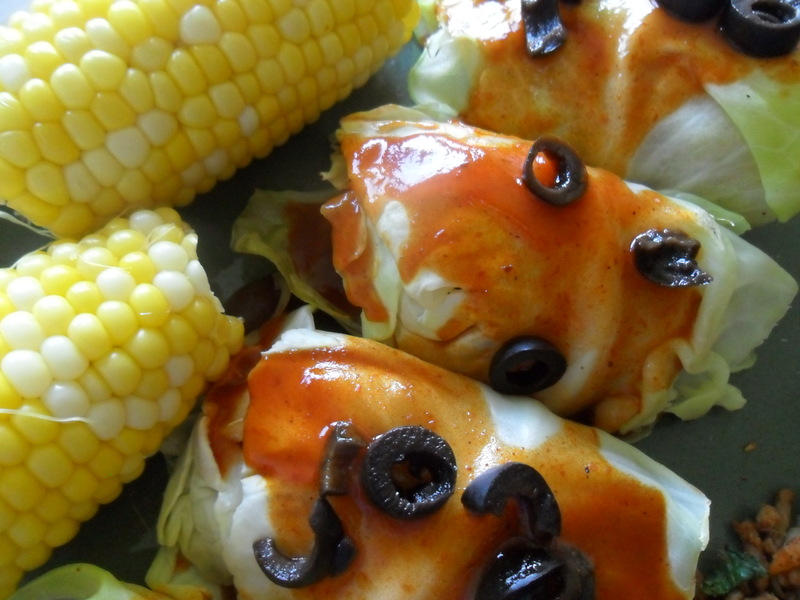 Drizzle with half of enchilada sauce. Layer two is meat. Layer three is veggies, the rest of the enchilada sauce, and cheese if you’re adding it on. Serve hot.